The inner solar system has been translated into music and it sounds like….Radiohead? The orbital motion of the solar system’s terrestrial planets are converted into musical pitches and rhythms and in an impressive and depressive cosmic coincidence, it appears that they’re attempting to play True Love Waits, Radiohead’s saddest song. To help them out, we enlist singer-songwriter Thom Gill to cover the vocals and choose real asteroids that naturally provide the required bass notes. The entire swarming asteroid belt produces the deep drone that begins and ends this gloomy cosmic dance. If the planets were all orbiting about 8 billion times faster than they are, they would produce pitches that could be heard by human ears (provided there was some kind of medium for the sound to travel through!). To begin, we play the pitches of Mercury, Venus, Earth, and Mars on the closest piano note once per orbit. With Mars playing a C, the other terrestrial planets fill out the same empty Cmaj7 chord that begins True Love Waits and with a similar haunting rhythm. The actual orbital periods, scaled frequencies, and closest notes of the solar system’s terrestrial planets. To produce these notes the orbits are sped up by about 8 billion times, or close to 33 musical octaves. 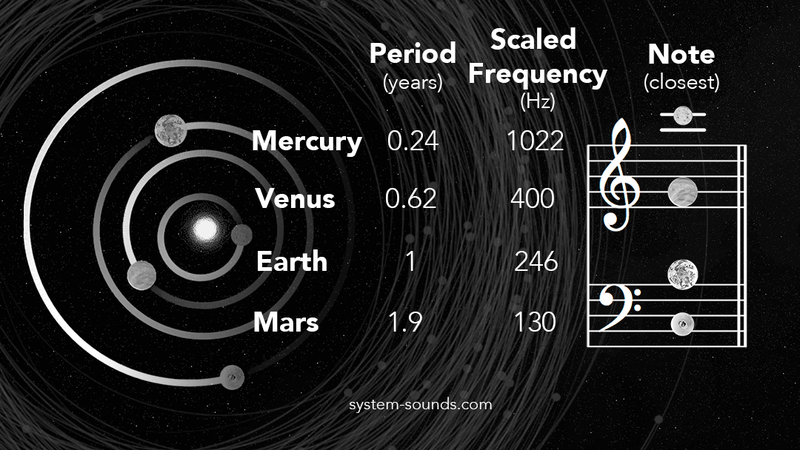 The fact that the orbital frequencies of the planets fall close to musical intervals is due to the many coincidental ‘near-resonances’ found in the inner solar system. For example, Earth orbits the Sun roughly 15 times for every 8 orbits of Mars. When sound waves oscillate with that relationship they produce a C and a B, which is what we call a major 7th. Similarly, Venus orbits just over 8 times for every 5 orbits of Earth which nearly produces a B to a G, a minor 6th,. Finally, the 23:9 ratio between the orbits of Mercury and Venus results in something close to a G and a C, an octave plus a perfect 4th. For other examples of musical-planetary resonances, see TRAPPIST-1, the most musical solar system ever found. When the orbits of the inner planets are sped up to match the harmony of True Love Waits, the slower orbits of the objects in the asteroid belt are in the perfect range to play the necessary bass notes. We select 6 real asteroids (Kreusa, Berbericia, Aline, Lucina, Hestia, Hebe) to cover the required notes F, G, G#, A, B, and C and highlight their orbits as they play. We also combine the notes from all of the asteroids orbiting between Mars and Jupiter that are larger than 100km across to produce the dark tone that starts and ends the song. If you look closely, you may be able to spot the dwarf planet Ceres on a nearly circular orbit in the middle of the asteroid belt. Vesta, the largest asteroid in the belt, is also visible on a more elliptical and highly inclined orbit. The role of the Sun is played by the intensely creative Thom Gill. His vocals are fed through a visualizer that shows the components of each note as if they were separate planets revolve in epicycles along each other’s orbits. This is similar to the (incorrect!) geocentric model of the solar system proposed by Ptolemy. In this mapping, a pure tone produces a circle while more complex tones may produce a circle with one or many smaller loops or wiggles. The noisy, inharmonic sound of a harsh consonant produces a speckled pattern. Together, they seem to form a sequence of exploding stars and supernova remnants. 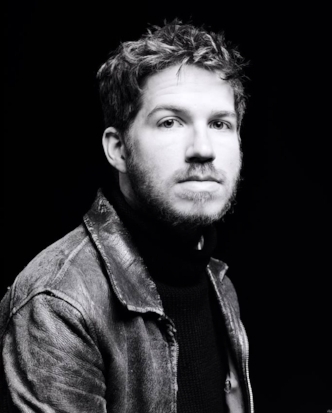 Thom Gill can often be found squiggling about on the guitar / keyboard / voice / computer with the likes of Martha Wainwright, Knower, Sam Amidon, Bernice, The Queer Songbook Orchestra, Diana, whoever will have him really. In 2017, data scientist RCharlie was able to quantifiably determine Radiohead’s saddest song. Using Spotify’s Web API valence, (a measure of a song’s musical positivity), along with Lyric Genius to measure the percentage and density of ‘sad’ words, he found that True Love Waits is the most depressing of them all. 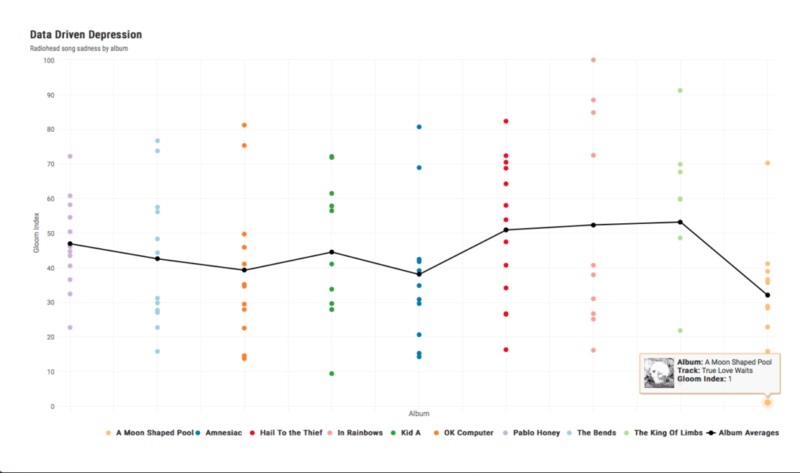 Click here for his interactive graph which shows gloom index scores for Radiohead’s entire studio catalog. Screenshot of interactive graph at www.rcharlie.com/img/posts/fitter-happier/album_chart.html.